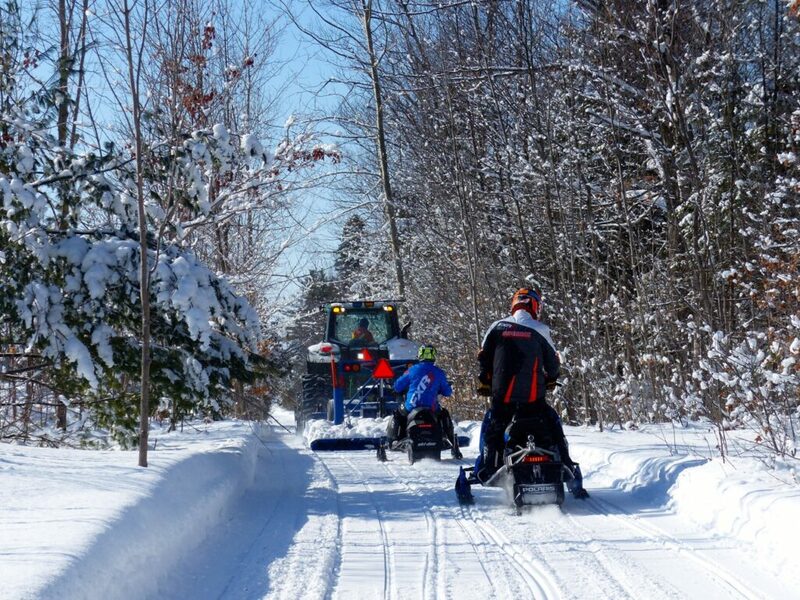 You can help gauge your risk of meeting snowmobile trail groomers by knowing a little about scheduling basics. 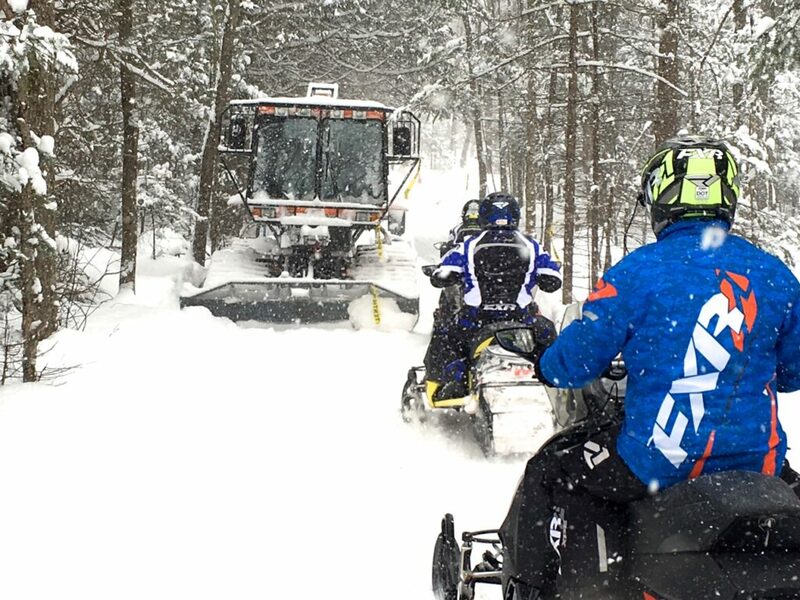 Although there are no hard and fast scheduling rules, generally your odds of meeting snowmobile trail groomers increase immediately before and after a weekend. So while meeting snowmobile trail groomers isn’t an every ride occurrence, it’s always best to be vigilant. Another set of variables affects groomers scheduling. Grooming’s less likely to happen in a snowstorm or even immediately after if the snow fell deeply. That’s because most groomer operators wait for the snow to finish before setting out. And because if it’s too deep, they need to wait for it to settle a bit or get broken and packed by sleds before going. Grooming is also less likely during a thaw because wet snow sticks to the drag. Speaking of operators, their paid or volunteer status and overall numbers can also impact grooming times. 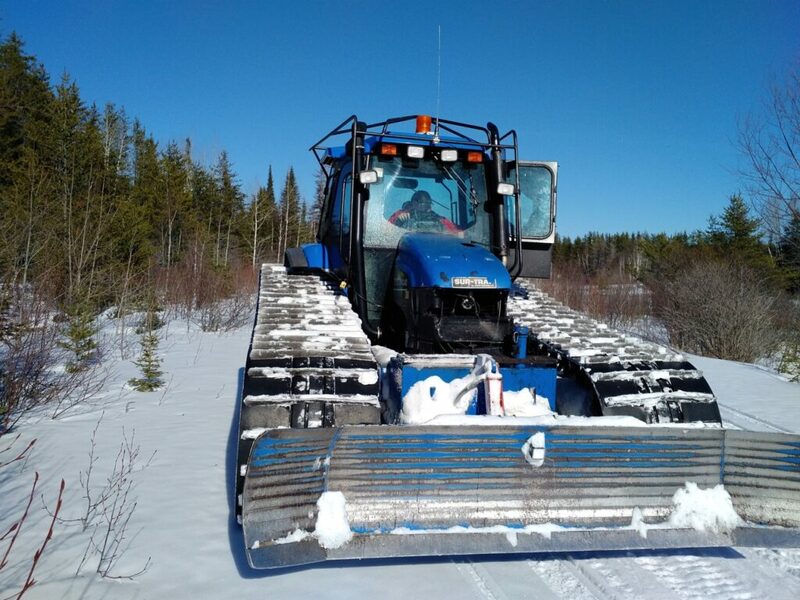 If there aren’t enough operators available for overnight grooming, then you’re more likely to be meeting snowmobile trail groomers during regular riding hours. Same goes when you factor in the number of groomers available and the distance to be groomed. If the number of groomers is limited and/or the distance long, each has to do considerably more work and is more likely to be out during regular riding hours. More and more grooming takes place at night. 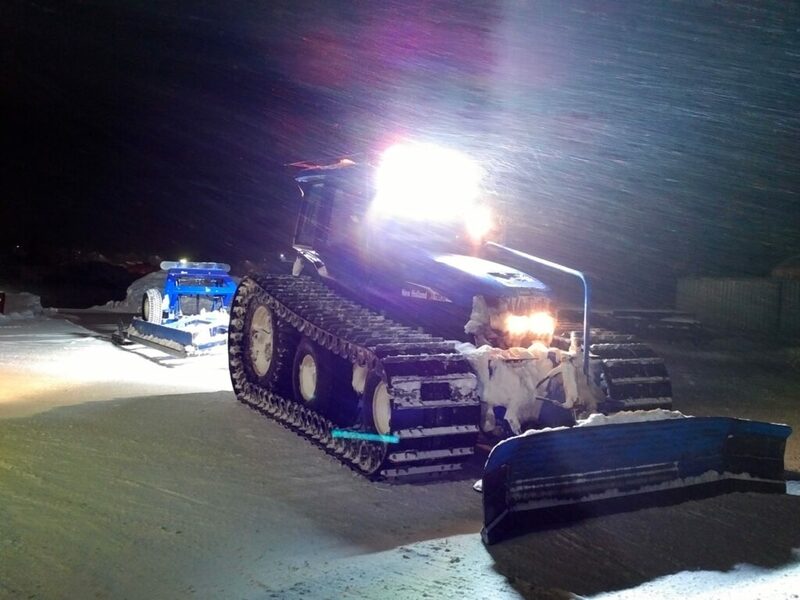 After dark, spotting a groomer is easier. Just watch for its lights. Obviously, if you don’t ride at night, this isn’t a concern. But many grooming runs often go from late afternoon to around midnight. So it’s best to be prepared for meeting snowmobile trail groomers from about 4 pm on any day. During the day, meeting snowmobile trail groomers is more risky. In some areas, daytime grooming occurs mostly on weekdays. This is when fewer snowmobilers are on the trails. Daytime grooming can also occur anywhere the distance is simply too long to cover in a shorter shift or night only. This is a more normal situation in remote and wilderness areas. 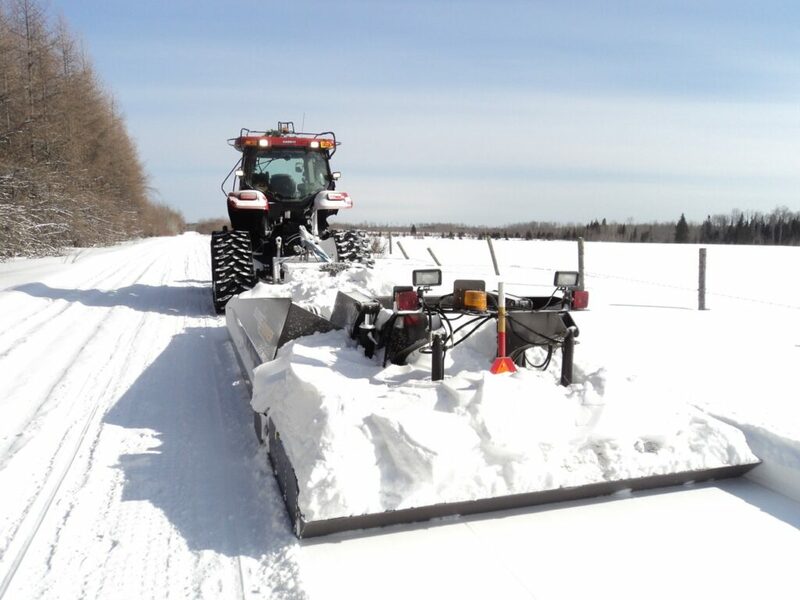 But in higher traffic areas, snowmobile trail groomers may also be out on the weekends. Here, daytime grooming usually happens later in the day Fridays and/or Saturdays after traffic starts to drop off. It can continue into the night. You can also help gauge your risk of meeting snowmobile trail groomers by pre-assessing each trail for the likelihood of a groomer encounter. 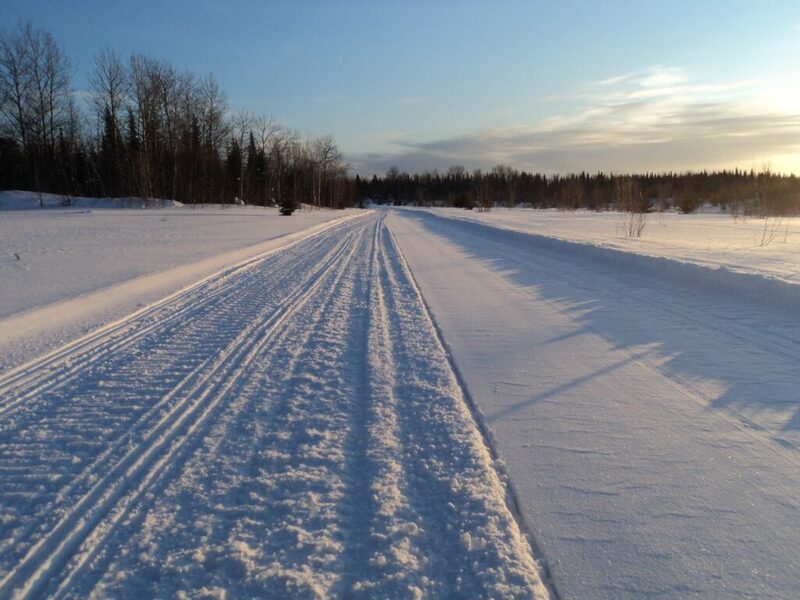 For instance, if the trail is a wide logging road, utility corridor, rail trail or on a field, you should be able to see a groomer from much farther away than on tighter, enclosed woodland trail. Similarly on a wider trail, you’ll likely have more space to pass a groomer. But the groomer may be tree to tree on a narrower one, so squeezing by may be tight. One way to know if the groomers are out and where is to ask the local club or at a trailside pit stop. Some snowmobile associations also have online groomer tracking. And some groomers have warning beacons that can be picked up through helmet communicators. Also, if you are following the tracks of previous sleds, which suddenly become smoothed over, you can be certain there’s a groomer ahead. 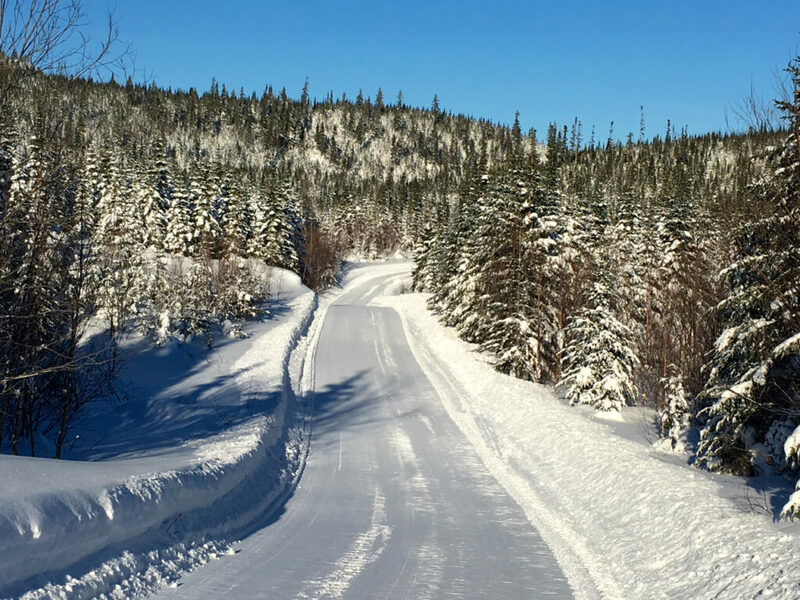 Generally, the more beat up a trail is, the more likely it is that you’ll be meeting snowmobile trail groomers sooner than later. More groomers are likely to be out just before and immediately after a weekend. But you can encounter one any time. So the next question is: Is it coming or going? If the entire trail surface ahead is freshly groomed on both sides, check to see where the outside edge of the drag has left its most recent mark. If it’s to the left of your centre that means your side was most recently groomed. So if there is a groomer ahead, it should be going away from you. This is always better, because overtaking a groomer that’s moving the same direction you are is slightly less risky. Unless of course, the groomer reaches the end of its run and turns around to come back toward you! Alternatively, if the drag mark is on your side of the trail (to the right of your centre, under your sled), it means the last pass was probably headed in the direction you’re coming from. 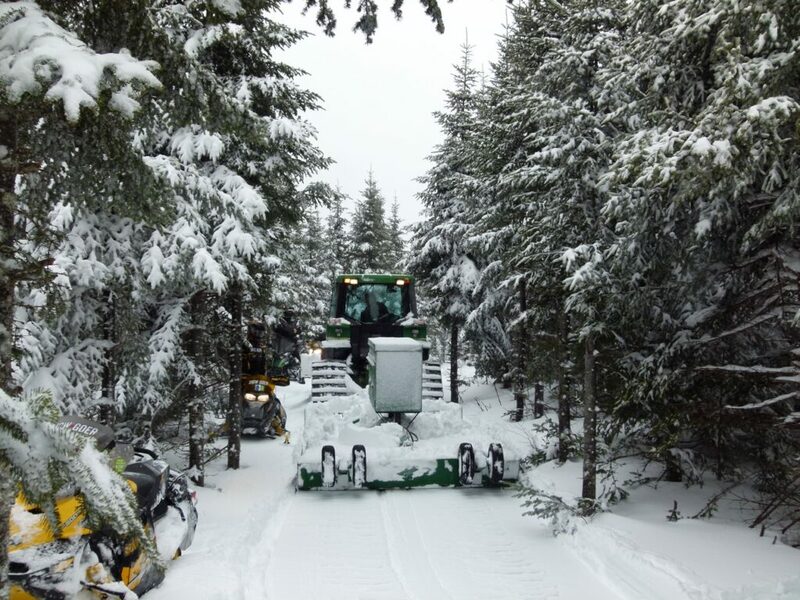 So meeting a snowmobile trail groomer ahead is less likely depending on when it’s scheduled to do this trail again. Obviously, if you’ve already met and passed an oncoming groomer, the odds of meeting another one on the same trail at that time are quite low. If the trail is narrow enough that the drag has groomed the entire trail in one pass, leaving no drag mark, it’s hard to know which way the machine was headed. But if you haven’t already passed the groomer, it’s more likely to be ahead. If the snow surface is fairly hard, that means the trail has had some time to set. So the groomer is likely far ahead or gone completely. If the surface is still soft, that machine might be just around the next corner, so better be cautious until you know for sure. If the trail ahead of you looks freshly groomed only on your side, it may mean there’s a groomer ahead going away from you. Again, check the snow consistency to estimate how far ahead the groomer might be. And always be on the look out for one that has turned around to head back your way to smooth the other side. Check out the other side of the trail too. If the other side is already groomed, but your side is not, this means the groomer is likely behind you somewhere. If you didn’t see it that means it probably turned off for a fuel or rest break. Or its run is completed and it’s back to the garage. Whatever the case, there’s little risk of meeting it. Occasionally, you’ll experience meeting snowmobile trail groomers abandoned temporarily due to break down or getting badly stuck. Usually, the operator marks the trail ahead and behind with caution tape or warning cones. But you can still come up on that unexpected and stationary obstacle very quickly. Depending on when and where the problem occurred, there may not be a fresh groomed trail to tip off riders that a groomer is even nearby! 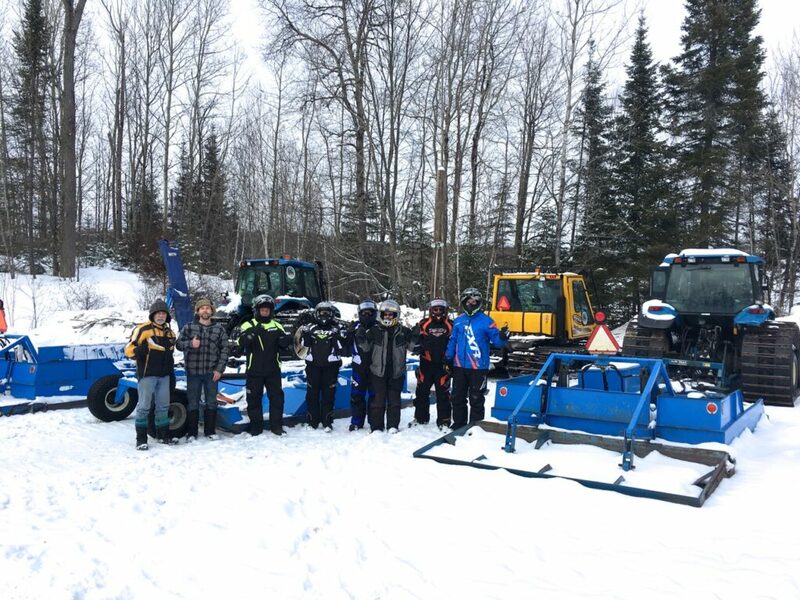 Based on my experience, I’ve tried to provide a few pointers to help you get a better feel of when meeting snowmobile trail groomers could happen. But the truth is, an encounter can occur any time, so always be careful out there. And be sure to give the operator a big thumbs up for a job well done!